Have any of you ever heard of the show Dirty Jobs that is on the Discovery Channel? It stars Mike Rowe and his mission is to discover the dirtiest jobs on the planet. We do not have a TV but when we were at my in laws house one day, we watched an episode (or two...don't remember). Well, this guy KNOWS how to find messy jobs and some of the ones he finds are downright disgusting. In each of our lives, we have a "Mike Rowe"; someone who can find a huge mess and make a mess of themselves in the process. Let's face it-some people actually love it too! I have two children who are excellent at doing this. (Hubby has his moments as well. :) ) Some days, I don't know how, where or why they find the messes that they do but there are times when I am just in awe at how much cleaning up I do. Well, if you are like me and are constantly faced with impossible clean up tasks, I have a product to introduce you to that should be a huge help to you! Brand new on the market, there is an awesome product line called My Dirty Jobs and these cleaning products are named after Mike Rowe's show! The whole idea is, there is no mess too big,no job too impossible and no stain to stubborn for these products. Here is a bit more about My Dirty Jobs and Mike! In addition to being known around the world as the “Dirty Jobs Guy” and the voice of shows like “Deadliest Catch,” Mike stays busy with speaking engagements around the country and working with partners like Caterpillar, Ford, Master Lock and Kimberly-Clark. He has launched a line of co-branded footwear with Cat Footwear and is launching a line of Dirty Jobs cleaning products in spring 2012. My Dirty Jobs, LLC, the newest entrant in the household cleaning category has partnered with leading suppliers, brand owners, and developers to create a high performing line of household cleaning products, which deliver superior value at both the register and at home. Inspired by Mike Rowe and the hit TV series Dirty Jobs, the company’s growing portfolio of products will focus on the same core themes most associated with Mike and Dirty Jobs, namely hard work and value. Throughout 2012 there will be a steady stream of announcements as the company expands its family of products and distribution partners. Anyway, for this review I was sent a full-sized bucket of Dirty Jobs Heavy Duty Complete. This product is a multi-purpose cleaner that boasts extreme and unsurpassed cleaning power...perfect for tackling those spring cleaning projects!! Because Dirty Jobs Heavy Duty Complete is perfectly safe to use on fabrics, I decided to give it a try when doing my laundry. It is supposed to help freshen and brighten clothes and my children's clothing gets so dirty that even my regular detergent won't get them as clean as I would like. This product is in a powder form and comes with a handy scoop with measuring lines on the side so you use just the right amount for the "mess" you are cleaning. If you are using it for laundry, they recommend using the smallest measurement (lowest line on the scoop). As my washer was just beginning to fill, I put the recommended amount in the water and then added my detergent and clothes. When my load of wash came out and went into the dryer, I took note of the colors of my clothes. They looked the same to me, but the whites looked a bit brighter. The socks weren't a brownish tint anymore and I was THRILLED! Not only can you use Dirty Jobs Heavy Duty Complete in your laundry (safe for HE washers as well), you can also use for bathroom cleaning, carpets, upholstery, tough stains, grease and much more! The secret lies in the oxygen-powered enzymes that are infused into this cleaner. It is also biodegradable, non-toxic, safe for colors and contains no chlorine bleach or ammonia. 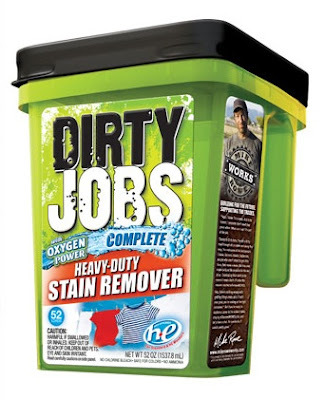 A 52 ounce bucket of Dirty Jobs Heavy Duty Complete retails for $9.95 (WOW!!!) and can be purchased from Walmart or the Dirty Jobs website. Dirty Jobs has offered to give away a bucket of this cleaner to one of my readers! Want to win? Here's how! Disclaimer: I received no monetary compensation for this post.I did receive a free bucket of Dirty Jobs Heavy Duty Complete for review purposes. All quotes and stock photos are from the My Dirty Jobs website and email. Prize is being shipped and provided by the sponsor. All thoughts and opinions are 100% mine. I like the heavy duty carpet cleaner. I would like to try the Dirty Jobs Heavy-Duty Carpet Foaming Cleaner. I also like their Dirty Jobs Heavy-Duty Bathroom Foaming Cleaner. Another product I would like to try is the Dirty Jobs Heavy-Duty Fast-Acting Gel Drain Opener. :-) Thank you. I would like to try the Dirty Jobs™ Heavy-Duty Bathroom Foaming Cleaner. I would love to try the Dirty Jobs Heavy Duty Foaming Bathroom Cleaner. Thanks so much for hosting this wonderful giveaway! I'd like to try the heavy duty degreaser, because a lot of my messes involve grease! I would like to try the laundry spot stain remover! The Heavy-Duty All-Purpose Degreaser looks great for hubby! Id love to try The Heavy Duty Multi Surface Cleaner! Another Dirty Jobs product that I would like to try is the Heavy-Duty Bathroom Foaming Cleaner! I would like the disinfecting spray. You can also purchase the line at your nearest Lowe's. I wouldike a sample of the Dirty Jobs Heavy Duty Complete. jmkelpine@gmail.com. Thank you. I would love to try the Dirty Jobs Heavy Duty Bathroom Cleaner. I LOVE the laundry powder! My Walmart has been out of it FOREVER!!!! excited to try ALL their products....where can I find the full line??? ?